Garlic Potato Salad starts with tiny baby potatoes that are roasted until crisp on the outside and fluffy inside. 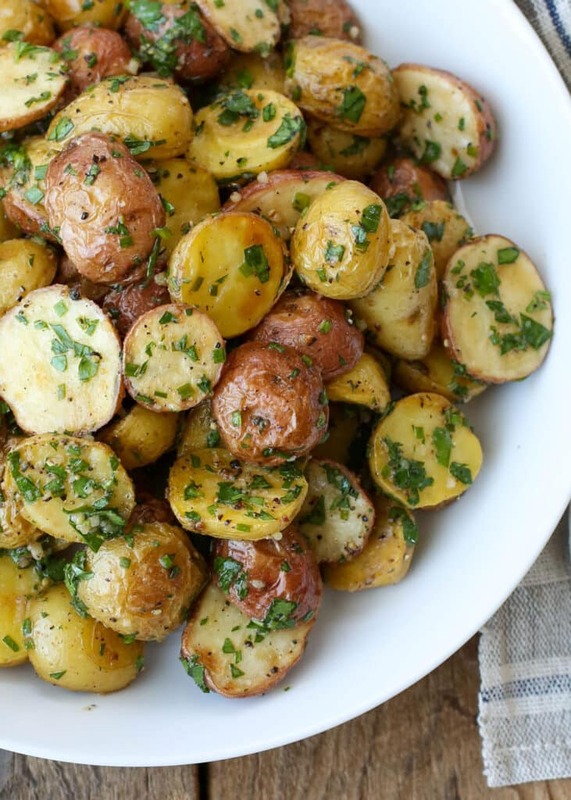 After roasting, the hot potatoes are coated with an abundance of garlicky oil and vinegar before being tossed with plenty of chives and parsley. When I say that this potato salad is a garlic lover’s dream come true, I’m not exaggerating. I have made this twice already this week and I plan to make it again next week too. If you’ve known me for long, you know just how much I love sharing amazing recipes that come together with a minimum of fuss. I’ve partnered with NESTEA to share a simple dinner solution with you today. This Garlic Potato Salad is a great example of how simple fresh ingredients can be used to create a memorable meal with just a few minutes time spent in the kitchen. Here in Phoenix, we’re already well into the crazy heat of summer. And once it gets hot outside, there isn’t much I like more than foods that I can pull together early in the morning and either reheat or serve cold or at room temperature whenever we’re ready to eat later in the day. The Garlic Lover’s Potato Salad isn’t your typical mayonnaise potato salad. This potato salad is delicious served hot or at room temperature. There’s no need to keep it cold if it’s left out on the counter for a few hours. Want a few more irresistible potato salad recipes? Try the Bacon Potato Salad or the Lemon Rosemary Potato Salad. This Loaded Baked Potato Salad by Melissa’s Southern Style Cooking is a hearty potato salad that your whole family is going to love. And for something a little different, I’m looking forward to trying this Turkish Potato Salad by Give Recipe. The first time I made this Garlic Potato Salad, I could not stop eating it straight out of the mixing bowl. The potatoes are completely irresistible covered in garlic and so much pepper. They’re fantastic piping hot from the oven (just try not to burn your mouth!) and they’re every bit as tasty at room temperature. That makes this a heck of a “keeper” recipe for barbecues, picnics, and potlucks all summer long. 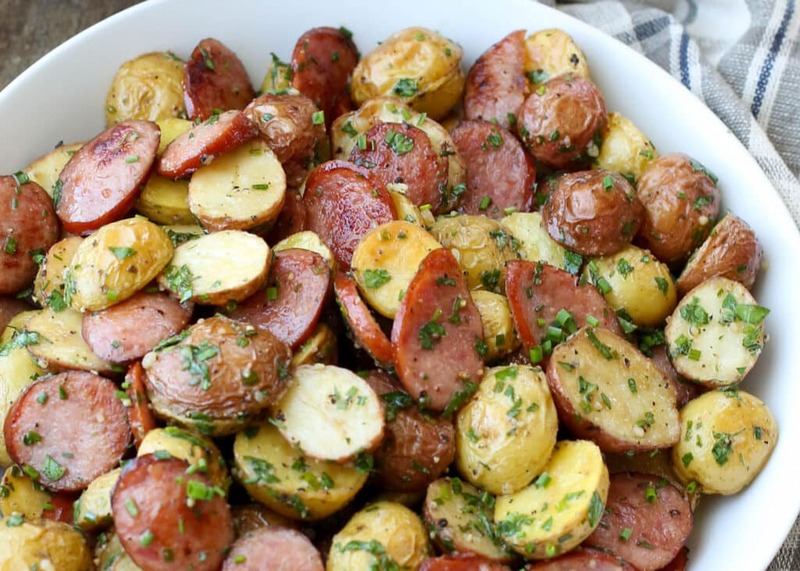 I loved these potatoes so much that I came up with a quick and easy way to transform this amazing side dish into a quick and easy dinner for the family. Saute some kielbasa just long enough to crisp the edges and lightly brown the sausage while the potatoes are roasting. 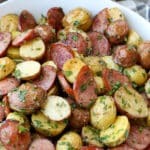 After the potatoes have been tossed with the garlicky dressing, add the hot sausage and serve hot or at room temperature. Because both versions of this recipe serve nicely at room temperature, this Garlic Potato Salad is an excellent make-ahead meal in the hot summer months, both with and without meat. I served this potato salad with lemon and herb grilled chicken the first time I made it and my family loved the whole meal. QUICK AND EASY DINNER OPTION: Slice 12-16 ounces Kielbasa sausage very thinly. Warm 1 teaspoon olive oil in a large skillet over medium-high heat. Add the sausage and saute for 5-6 minutes until lightly browned and slightly crisp. Add the sausage to the bowl with the potatoes and toss to coat everything in the garlic dressing. Serve warm or at room temperature. Garlicky roasted potatoes are tossed with fresh herbs to create an unforgettable potato salad that can be served warm or at room temperature. I like to buy the tiniest potatoes I can find for this recipe and simply slice them in half. However, any potato will work. Simply cut the potatoes into 1-inch pieces. Disclosure: I’ve partnered with NESTEA to share this recipe with you for #SimpleSolutions #NewNestea and @NESTEA. Thank you for supporting the brands that make Barefeet In The Kitchen possible. As always, all thoughts and opinions are my own. Would have meatballs with that. Sounds great! My husband and I definitely classify as garlic lovers so I'm sure we would enjoy this recipe! I love potato salads and this one sounds like an absolute winner. Your recipes are out of this world, thanks so much, love that you can print them.